First, let’s address the big thing we’ve all noticed in Weight Watchers International (NASDAQ:WTW) and that’s the stock has been a huge dud. 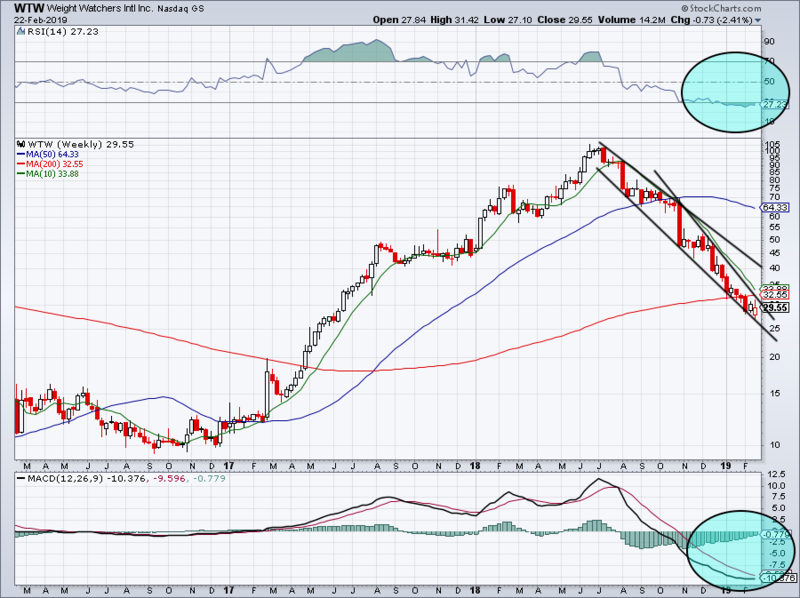 WTW stock is down roughly 60% over the past 12 months and has been trapped in a massive downtrend. Why would anyone want to enter this name ahead of earnings, scheduled for tomorrow, February 26, after the close? Source: Shutterstock Well, there are actually a few decent recents to consider owning WTW stock. When the calendar flips to a new year, people turn to making resolutions. “New year, new me,” they say. For many, that means dieting and exercise, which means more money for Weight Watchers. As we push into the summer season, beach-bod goals have more customers jumping into a Weight Watchers plan. Put simply, while Weight Watchers stock may not enjoy fiscal Q4 as much as many other companies — say like a Canada Goose (NYSE:GOOS) or Hasbro (NYSE:HAS) — it has six solid months of business coming. Fiscal Q1 and Q2 are the company’s two strongest quarters. But if guidance is weak, investors will ignore that catalyst. They need a strong outlook from management to get this stock flying. It’s hard to be overly bearish on a stock that’s already down 60% over the past year. Further, it’s hard to be bearish on that stock when it’s expected to earn $2.86 per share for fiscal 2018. Not only is that up almost 75% from fiscal 2017 (assuming WTW can deliver in-line or better Q4 results), but it also values WTW stock at just 10.3x earnings. Revenue is set to grow more than 17% in fiscal 2018 and analysts see even more growth ahead. Growth estimates for 2019 stand at 8.2%, with earnings forecast to grow another 20% to $3.43 per share. Again, it’s important that Weight Watchers is able to deliver a solid outlook, giving investors a reason to bid this name higher. We need to see strong subscriber growth and know that business is holding steady. While Q3 wasn’t a bad quarter, the company did miss on earnings and revenue expectations. Interestingly enough though, management raised its full-year outlook in the quarter, so it’s surprising that investors didn’t cut WTW a little slack. Either way, it doesn’t matter. We need a solid quarter and outlook to get the bulls back on board. Analysts are looking for 60 cents per share in Q4, down from the 63 cents per share they were looking for 90 days ago. On the revenue front, Estimates call for ~$347 million in sales. As we saw in Q3, the results do matter, even if the outlook is strong. On the balance sheet front, WTW would be more attractive if the company didn’t carry $1.6 billion in long-term debt, although that is down more than 25% from fiscal year-end 2015. Remember, this is a ~$2 billion market cap company, so its balance sheet is somewhat less than ideal. Despite some of the seemingly positive developments at Weight Watchers, we have one true guide: price. Simply put, it’s been a rough ride for WTW stock. However, shares are oversold and momentum is seemingly bottoming out, as indicated by the blue circles on the RSI and MACD measurements. Weight Watchers stock also has a 17% short interest. On the weekly chart, as shown above, the 10-week moving average continues to pressure the share price lower. It is now below the 200-week moving average as well. If we get a positive reaction to earnings, I need to see a close over the 10-week moving average near $33.80. Should we get it, then it can kickstart a larger rally, perhaps up to $40, where a prior downtrend line current resides. Should WTW stock react negatively to earnings, look to see that the bottom of downtrend support holds, currently near $25. The post Should You Buy Weight Watchers Stock Ahead of Earnings? appeared first on InvestorPlace.